In passing the Local Control Funding Formula in 2013, the Legislature shifted decision-making back to local districts and steered more money to districts with higher proportions of low-income children and English learners. Proposition 98, adopted in 1988, sets the overall yearly level of K-12 and community college spending through a complex formula tied to the growth in the state economy. District is surveying community and board plans to hear feedback from public on proposed budget cuts at meeting next month. The governor wants California Supreme Court to give public agencies, like school districts, the ability to change pension benefits for current workers in hard times. District proposes cuts of $7 million to central services and $3 million to schools, along with $6.5 million in other spending reductions or savings. Two panels of teachers and principals were asked to design minimal staffing, programs and resources to meet state expectations for educating all students in California. Their finding: Add $22 billion to the tab. Two districts facing budget deficits get state budget lifeline, but only if they make changes. Getting Down to Facts II finds strong support for education reforms but also obstacles to student achievement and a need for more funding. Here are the take-aways from the studies on special education, funding needs, a teacher shortage, a data deficit, student mental health local control's unmet potential – and more. 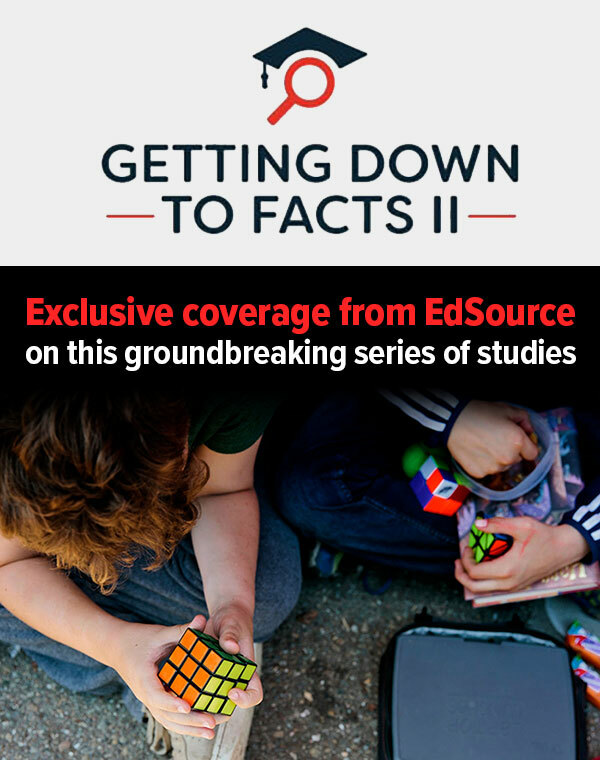 Getting Down to Facts II research project scrutinized how California's schools are doing after a decade of policy changes. Proposed legislation related to districts in fiscal distress would provide state aid to cover a portion of future deficits. The Bay Area district is seeking donations to offset a $500,000 budget cut that originally would have eliminated 10 sports. District scrambles to comply with Title IX requirements, seeks donations to keep other sports alive. Bay Area district hopes city voters will approve a new bond measure in the future to pay for projects not completed through Measure J funds. Strikes in low-paying states opened the public's eyes. In California, where teachers are among nation's highest paid – cost of living aside – Education Next's 2018 poll found more support for raising overall funding than teacher pay. Promise Academy disagreements with San Jose Unified mirror tensions escalating statewide over charter schools. District adopts revised three-year budget after Alameda County Office of Education rejected budget adopted in June.